Red Kap Sales vice president Jon Kaplan presents a donation to Principal Ana Yeomans for the Genet Makerspace. Genet Elementary School’s new MakerSpace received two donations this month from Red Kap Sales, a supplier of Exxon/Mobil, totaling $1,000. The money will be used to purchase building materials such as Lego systems and simple machines. 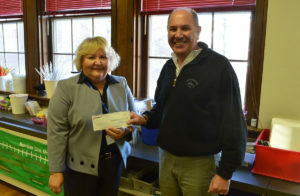 Red Kap Sales vice president Jon Kaplan brought a $500 check as a donation to Genet earlier this month, and while on a tour of the MakerSpaces, he decided to contribute an additional $500. “I’m so moved by what you’re doing here,” Mr. Kaplan said. Genet introduced the MakerSpace program last month with two dedicated classrooms on the second floor. Classes sign up for timeslots to work on projects that support engineering, design and problem solving.